(1) The last tube of the evening is often quiet, and you appear to be the last passenger left aboard. You'd rather have caught the train before, or even not come out tonight at all, but at least you should be home soon without needing to take the nightbus. It's also possible you nodded off just now, but the train rumbling into the next station has awoken you with a start. Where are we? That's unusual. You don't remember there being a station of that name on the line, and the spacing is somehow all wrong. Quick, the doors are about to close, what do you do? Stay on the train  or leap off onto the platform ? (2) The long passageway bends and twists, at one point seemingly doubling back on itself. You realise that you haven't seen a Way Out sign for some time, but the intended direction of travel remains clear. A check on your mobile phone confirms No Service, as it has done since you arrived. But it's fine, you think, this passageway must be leading somewhere. Eventually it passes the foot of a spiral staircase, leading upwards. As the direction for a Way Out, this feels promising. Should you ascend , or follow the corridor ahead , or retreat the way you came ? (3) The driver does not respond. You sort of guessed they wouldn't. Instead the doors close and the train heads off into the tunnel again. So when the train subsequently pulls into Graves End, yet again, a familiar choice presents itself. Stay on the train  or step off onto the platform ? (4) The Way Out signs continue along the platform, which is reassuring. They lead to a passageway which bends right, then left, then continues straight ahead towards a distant corner. The tiles to either side are a grubby white, with a black strip across the top and a blood red strip along the bottom. It's quite a trek. Suddenly the silence is broken by the sound of a train, somewhere behind you, presumably pulling into the platform you arrived on. You could dash back to catch it  or, more sensibly, continue along the passage towards the exit . (5) The corridor is beautifully tiled, and conveniently empty, not that a perfectly symmetrical Instagram snap is uppermost in your mind. A panel of ripped advertisements displays the logo of a long-defunct car manufacturer and the top half of a man in a bowler hat. Before long you reach a short cross passage, which it turns out links the platform you first arrived on  and its opposite counterpart . (6) The passageway is long and sinuous, at one point seemingly doubling back on itself, but there are no further junctions. At one point you think you can hear footsteps behind you, but the sound ceases when you pause to listen, so it was probably just an echo. Yelling out for help has no effect either, other than to unnerve you even further. But eventually, after one last left-hand bend, the passageway ends... back on the platform where you first alighted . (7) As the train heads off into the tunnel you stare out at the fast-disappearing platform. It looks normal enough, if a little run-down, and some of the adverts look older than you'd expect. No problem. You settle back in your seat and fiddle with your phone to make sure you stay awake. Pity there's no wi-fi showing . (8) Even as you step cautiously down into the gloom and around the bend at the foot of the stairs, you know this is unlikely to be the way out of the station. The next section of passageway is totally dark, and even shining the light of your mobile phone fails to make much of an impression. Dare you continue ? Perhaps you should have been more diligent following the Way Out signs from the original platform , or perhaps taking your chances along the tracks would be a better bet . (9) The spiral staircase seems to go on and on. After you've been ascending for a couple of minutes you decide this can't be right, and change direction and head back down again. But no matter how far you descend you never find the entrance from the corridor, and no matter how far you climb you never find the exit... the stairs just spiral round and round forever. (10) After a couple of minutes the train slows and pulls into the station you were actually intending to alight at. Well that's alright then. You step up to the doors and wait for them to open, except they never do. Instead the train starts up again, accelerates past an entirely empty platform and enters the darkness of the tunnel. It's OK, you can always get off at the next station, it's only a short walk. 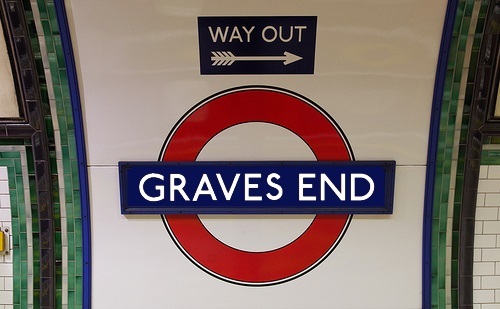 But the next station turns out to be... Graves End, again, which really shouldn't be possible. When the doors open, you face an unusual dilemma. Stay on the train  or step off onto the platform ? (11) The second platform looks very similar to the first, except there's no Way Out sign as a hint to which way to go next. The adverts are as old, the tiles are as tired, and the illumination is just the wrong side of helpful. Checking the tube map poster doesn't help - Graves End is nowhere to be found. The Jubilee line doesn't appear on the map either. The far end of the platform is rather dark, should you want to risk exploring down there . Otherwise you'll have to return to the cross passage and decide whether to follow the side corridor  or return to the original platform and follow the Way Out signs . (12) Almost immediately after you step onto the platform the doors close behind you and the train disappears off into the tunnel. Great. It's eerily quiet, and it looks like you're the only person here. The adverts on the far wall look like something from the 1970s, but you don't recognise any of the brand names. According to the sign above the roundel, the Way Out is off to the right . (13) You make slow, careful progress forwards into the darkness, holding one hand against the tiles as you go. Then suddenly the tiles stop, and your legs stumble into a stone slab at knee height, knocking you headlong into a deep pit. You slump down against the earth and await your inevitable fate. Graves End? What kind of a name is that? (14) When you reach the platform on which you first alighted, it's empty. After everything that's happened so far, somehow this isn't a surprise. You can't even see any mice in the pit down beneath the rails. Will you return to the long passageway following the Way Out signs , or walk down to the far end of the platform instead ? Alternatively there is a small wooden bench a little further along... you could always wait there . (15) At the far end of the platform, where GRAVES END is written into the tiles along the wall, a short passageway leads across to the opposite platform. Perhaps that would be an interesting place to investigate next. Alternatively, halfway down is the entrance to a long corridor, which looks tempting as a potential emergency exit. Do you follow the side-corridor , or carry on through to the opposite platform ? (16) The far end of the platform is not enticing, with levels of illumination well below anything health and safety would recommend. But a little light is leaking through a gap in the wall, which turns out to be the top of a steep staircase. Unusually, for an underground station, it leads downwards rather than up. Might this be your way out ? Or would now be a good time to jump down onto the tracks and try walking out through the tunnel ? (17) You endure a nervous wait to see what the next station is actually going to be, and... it's Graves End again. Something about this situation is extremely wrong. You could stay on the train, despite having a pretty good idea where you'll end up . You could step off onto the platform . Or you could activate the alarm and try to talk to the driver . (18) The corridor is beautifully tiled, and conveniently empty, not that a perfectly symmetrical Instagram snap is uppermost in your mind. A panel of ripped advertisements displays the top half of a man in a bowler hat and the logo of a long-defunct car manufacturer. Before long the corridor passes the foot of a spiral staircase, leading upwards. As the direction for a Way Out, this feels promising. Should you ascend  or continue along the passageway ahead ? (19) Stepping onto live tracks is never a good idea. That public information film you once saw at school flashes briefly through your mind before you drop to your knees and keel over. 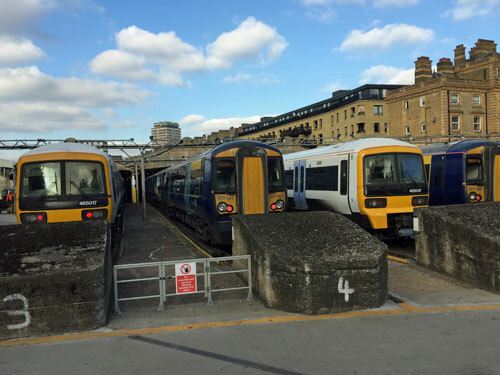 (20) No matter how long you sit here no further lost passengers appear, no member of staff arrives to clear the platform after the last train, and no announcements break the unnerving silence. You're going to have to make a move, either back into the long passageway following the Way Out signs , or down to the far end of the platform to explore there . 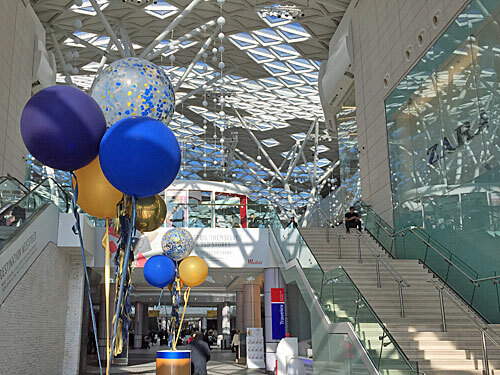 Today is Westfield's 10th birthday - the proper Shepherd's Bush one rather than the scuzzier one in Stratford. It would be easy to write a post bemoaning how consumerist the place is, but also pointless, given that's the reason for its existence. So instead I've challenged myself to list ten things Westfield gets right (as researched yesterday on a failed trip to buy a woolly jumper). 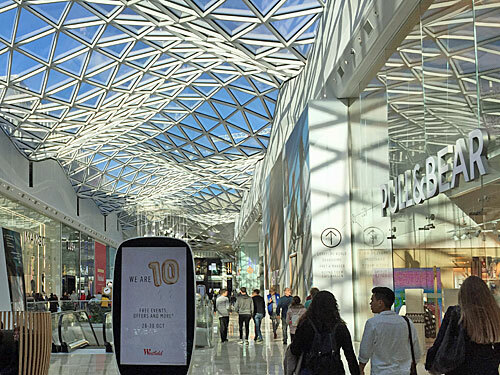 London's retail offer is world class, but pre-Westfield it lacked a decent shopping centre. Most large British cities have a central area where all the big shops are, somewhere to head to find all the big chains. But even Oxford Street never quite delivered on that front, being too linear, too overcrowded and unforgivingly unpedestrianised. Westfield is an unashamed mega-mall, the largest shopping centre in Europe, an indoor place where that brand you want is never too far away. From engagement rings to shampoo, from House of Fraser to Carphone Warehouse, and from Louis Vuitton to the Post Office at the back of WHSmiths, all your weekly purchasing needs are catered for here. Westfield's multi-level circuits provide a potentially endless mall experience - browsing here, nosing there, and popping back to pick up that bargain you spotted earlier. Flustered families can hire a kiddy car for their littl'un to drive around in, or drop their charges off at Kidzania, the ultimate middle class babysitting opportunity. When that pales, numerous food and drink opportunities are available, plus a cinema, a gym, mini golf, a bowling alley and (imminently upcoming) the obligatory ice rink. There's even more than one loo, just to ensure visitors don't stray. Arrive at 10am, depart at 10pm, and make day of it. We eat out far more often than we used to, and Westfield knows this, hence its dining options are genuinely multifarious. The entire southern terrace is lined by restaurant chains, each with a few tables out front (but safely under cover) to push the point home. There's nothing especially foodie here, more your Jamie's Italian or Carluccio's, but even at noon on a Monday the restaurants are busier than many of the shops. The concept of a pick-n-mix food court is nothing new, and £11.50 for cod and chips is hardly good value. But Westfield is now so confident a dining destination that friends can simply agree to meet here, and decide where in the world to splash out after they arrive. Close enough to the centre of town to feel important, but far enough out to be drivable, Westfield's found the sweet spot. No successful shopping centre survives without a car park, so Westfield embraces the concept with stacked and basement parking spaces. At £6 a day it's not even terrible value for money, assuming you're bringing the family and intend to buy plenty to lug home. Then there's the tube station they tarted up in 2008 so it was ready for the crowds, plus the extra tube station they helped fund on the Hammersmith & City line, not forgetting the tumbleweed bus station where the multiplicity of buses regularly exceeds the number of waiting passengers. Consumer, know thy place. In Westfield's southeastern corner is The Village, an unashamedly luxurious quarter dripping with chandeliers and premium brands. Packing Versace and Aquascutum, plus smart concessions where pillboxed ladies preen jewellery on cushions, this is the bit which lures international travellers with currency to spend. Close by is a young, zippy, fashion-led segment, then another bloc for aspirational accessories, until eventually you wend down to the Burger King and Superdrug zone. It's like walking from Mayfair to Romford in the space of a few minutes. Whatever your budget, you'll feel comfortable somewhere. I hate walking through Stratford's Westfield, whose linear triple-decker malls are too narrow for easy passage, and proper nightmarish at the height of the weekend. Shepherd's Bush's Westfield, by contrast, is blessed with broad passageways, vast piazzas and, best of all, alternative routes. It even boasts plenty of mid-mall space for nail bars, aqua massage, a proper barbers and somewhere to plonk down for an anti-ageing mask. I'm sure you've noticed Westfield doesn't believe in providing stairs, but numerous escalators are available for whisking between floors, ideal for when you suddenly realise what you want isn't up/down here but down/up there. A lot of retail venues like to keep you on your feet so that you're forced to take refuge in a cafe or restaurant when you start to fade. But Westfield has bucked the trend by placing clusters of benches, stools, sofas and chairs at strategic points around the ground floor for public use. And these are being well frequented, not for consumption of comestibles but as somewhere to sit down and check your phone. One clump was overrun by a group of teenagers pretending to talk to each other, another by a family allowing each member some social downtime, and a third by strangers intently scrolling through Facebook updates. How clever of Westfield to have spotted the zeitgeist and provided some digital breathing space. For its tenth year, Westfield launched a major promotional campaign featuring four characters they think embody the W12 experience. The chosen foursome appear repeatedly on all the display screens. One is Nigella Lawson, appealing to the smart, older, female demographic, and another is James Corden, representing the blokier lad who likes to splash out a bit. The third is Miss Piggy, which is inspired, hinting at glamour, sass and sheer family-friendliness. And the fourth is some model I couldn't name, which is how things ought to be for the maintenance of fashion cred. They may not appeal to you, but as an exercise in ticking all the boxes in as few faces as possible, this is a quintessential quartet. Staying ahead of the game is important, and Westfield has spun out its success with a huge northward extension. The new arm adds considerably to the retail offering, including electrical goods and a fresh focus on interior design, not to mention the John Lewis flagship tagged on at the end. There's even a Waterstones imminent, to make up for the Foyles which faded soon after the place opened, which is a store I might actually spend some time in. When Westfield plasters 'Something Exciting Coming Soon' across an unlet unit or empty mid-mall concession, they are overegging the pudding somewhat, but it is the promise of novelty which keeps 'em coming back. It's easy to get blasé about Westfield, now that London has two of them, with one more on the way. But if you haven't been before, the original still dazzles. I was standing outside Zizzi's when a grey-haired woman in a Crazy Cat Lady t-shirt approached up the escalator and said, simply, "wow". And she was only looking down the restaurant arcade - I can't imagine what she said after she stepped inside and saw miles of mall under the enormous spangly roof. Sure, it's a temple to consumerism, and sure, I couldn't find a woolly jumper I liked anywhere at a decent price, but ten years on there is nowhere else in London quite like it. Some London bus routes are linear, heading from A to B with a minimum of fuss. But other bus routes are twiddlers, meandering through backstreets to keep communities linked to the bus network. 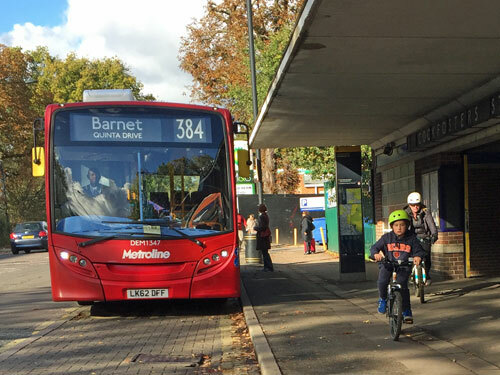 The 384 is an absolute twiddler, bending back on itself several times on its journey from Cockfosters through the estates of Barnet. This makes it a lifeline for some, but bloody slow for others, which previously has been an acceptable balance. But TfL now have plans to dekink the route, removing almost all of the twiddles, whilst simultaneously extending it to Edgware. Overnight the 384 would become much more direct, a new orbital route for the outer suburbs, conveniently linking the ends of three tube lines. But at the same time it would cease to serve a dozen residential roads, most of which have no other bus service, stranding some residents beyond the 400m limit TfL normally deems acceptable. For a map of the proposed changes, click here. Weekday afternoons in Cockfosters aren't generally busy, although the traffic's bad, and the incoming 384 is running late. While the driver takes a brief rest I spot a laminated notice stuck to the station wall - Save the 384 bus! - giving details of the consultation and urging passengers to make their voices heard. Somebody's been busy. This end of the route will be hit the worst, the first decapitated twiddle being only a few minutes ahead, so it makes sense to alert potential losers to the fight. Four of us are aboard when we depart, plus another three picked up from the shopping parade down the road, which isn't too bad when the timetable is "every 20 minutes". A lengthy Hail & Ride section kicks off almost immediately, up an avenue of latticed semis optimistically-named Mount Pleasant. A cheery elderly gentleman in a bow tie waves his stick for the bus to stop, and then we wait while he hobbles over to the point where our driver thought it safer to pause instead. Just past the roundabout are the mournful ruins of The Jester, a pub closed in 2013, then reduced to ruins by a mysterious arson attack earlier this year. Here the 384 breaks off for its first twiddle round the Bevan Estate - total duration two minutes - benefiting folk whose houses back onto woodland and the Pymmes Brook. We pick up three people on Northfield Road, two of whom are children who look like they'd benefit from more exercise once the bus is rerouted. Our next twiddle is the only one TfL intend to keep, a proper loop up to the gasholder and back via Westbrook Crescent. The reason for its survival isn't to save the very farthest resident a half mile walk, but because the Jewish Community Secondary School is tucked away up here, and its students are 1400 potential passengers. It being half term we only pick up two old ladies. I time the detour at 2 minutes 30 seconds, which is all the faff that future orbital travellers will have to endure if and when the 384's route is streamlined. Twiddle number three is just over a mile long, rather than the quarter mile it could be if the bus went direct. The fortunate beneficiaries are residents of Crescent Road, and the cul-de-sacs beyond, but also anyone who wants to go shopping on East Barnet Road. Here is the big Sainsbury's many local people shop at, soon to be joined by an Aldi, which the 384 will no longer go anywhere near. On my journey the stop outside Sainsbury's saw most of the passengers alight, and very few get on, because four other buses ply this road and they all head for High Barnet without twiddling. Our next wilful deviation is the other side of the railway, as the only bus which goes past New Barnet station. Tracing the devious route we're about to follow it's easy to view the 384 as a kindness, a zigzag drawn on a map to provide a convenience most other London suburbs don't receive. It made sense in 1990 when the 384 was introduced as a nippy minibus covering previously unserved roads, but in 2018 with a single decker such benevolence might appear over-generous. The roads are narrow, and meeting a Tesco van coming the other way could be a challenge, but our driver is well practised and we get by. Eventually we reach Barnet Hill, where the 384 is one of several routes climbing towards the tube station. By my calculations we could have got here 10-15 minutes faster by following TfL's proposed route, with a trio of twiddles taken away, but we also wouldn't have picked up half the passengers currently on board. There are quite a few now, and before the top of the hill some of them will be standing, which isn't bad for a route the consultation claims has "low" passenger numbers. I've checked the data and the 384 isn't in the lowest 10% of London's least used bus routes, which appears to give TfL's planners a lot of leeway for future fiddling elsewhere. 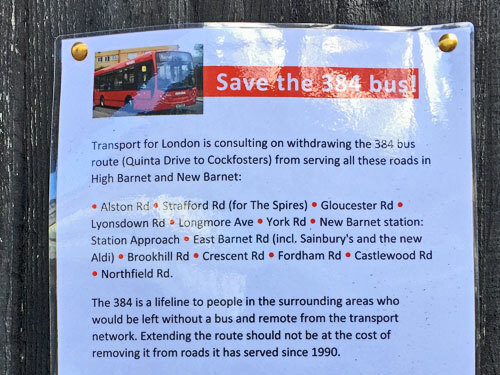 It's at this point, somewhat unexpectedly, that the campaign to Save the 384 bus! storms aboard. By this I mean that a young gentleman with a bagful of printed collateral pays his fare, checks with the driver that what he's about to do is OK, and proceeds down the bus handling out leaflets to all. It doesn't take long for informative discourse to ensue. "They want to take the 384 away from this list of roads." "We're trying to encourage people to write in and complain." 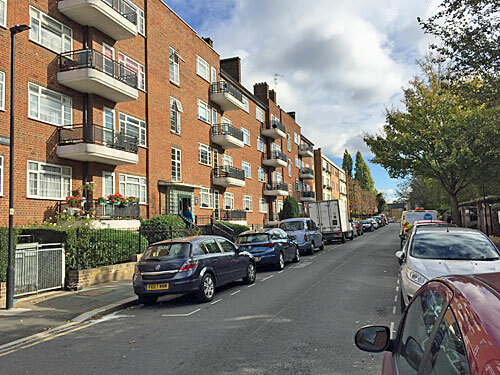 "We don't mind them extending it to Edgware but we don't want them taking it away from here." "No, they're not getting rid of the bus entirely." "Ask your mum to see if she'll sign the petition." Most passengers are interested, others alarmed. Joshua has to reassure some that their specific journeys won't be affected. One elderly gentleman, who sounds like almost everything makes him very cross, growls about how terrible this is, how badly parked those cars are and alights cursing at the next stop. We're now passing through Barnet's main shopping area, rounding the Spires, and passengers who want to travel beyond the town centre are starting to receive leaflets too. At which point, without warning, the driver plays the "this bus is on diversion" message, followed by "this bus terminates here", and immediately turfs us all off. Traffic delays earlier on our journey have disrupted the service. Much grumbling ensues. But Joshua takes full advantage of the delay, producing a roll of black sticky tape from his bag and attaching a couple of leaflets to the bus shelter, then holding court with a group of interested passengers. My scepticism regarding the effectiveness of these actions is quashed when a fresh arrival at the bus stop spots the new poster, gets out a notebook and starts jotting down the petition's URL. The proposed change won't affect her, given where she finally alights, so I suspect she'd been unduly worried by the poster's title. But this level of instant engagement could produce strong feedback which might just possibly persuade TfL to amend their plans. Eventually the following bus arrives and we bundle politely aboard. What follows is the last potentially severed twiddle, where the intention is for Alston Road and Strafford Road to be bypassed eastbound only. That's a few more Barnet residents with a bit further to walk to catch a bus, but seemingly a relief for some of those on Alston Road, one of whom has commented that the 384 is "causing traffic congestion and slaloming between residents' cars" and "the vibration of the revving and accelerating is causing our houses to shake". It must be horrible to have a bus go past your house when you're a misery who'd never dream of catching one. We're heading for Barnet Hospital, where the 307 terminates, its route from Cockfosters so close to the straightened-out 384 that you wonder why TfL are bothering to make the change. Joshua is one of a handful of passengers to alight here, leaving a pile of leaflets in the luggage rack and preparing to inform further travellers on a return trip. But most of those aboard are staying on to be dropped off at the final stops through the final housing estate, including the terminus at Quinta Drive. The name sounds mysteriously evocative, but in reality the bus pulls in outside an off licence with a stack of Andrex in the window. 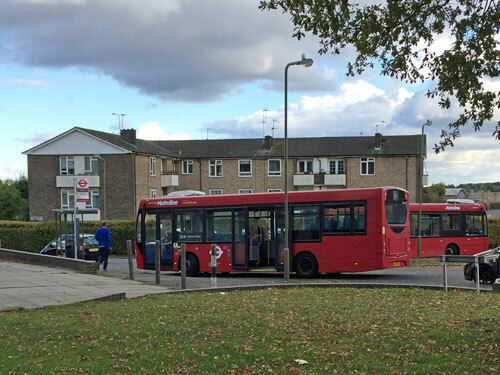 If all goes to plan, the 384 will be extended from here to Edgware. This is a considerable extension, almost five more miles in total, which is why the current bus route needs to be untwisted to make it viable. At present to make the same journey takes two more buses, the 107 and then the 292, so that's what I attempted to do next. I had to walk up the road to catch the 107 and wait, which took some time. I had to change buses outside the Morrisons at Stirling Corner, waiting patiently for a 292 to arrive, which took some time. I got to sit in a traffic jam on the A1, which took even more time. And by the time I finally reached Edgware station it'd taken me an extra hour, suggesting that one bus would indeed be much better than two. The sting for residents of Borehamwood is that TfL intend to cut the frequency of the 292 to pay for the extension of the 384. It currently runs every 15 minutes and will drop to every 20, because TfL don't mind if Hertfordshire residents get a worse service. I'd even say they could be setting up the 292 to be completely scrapped, because its northern section is outside London, its middle section will be perfectly paralleled by the extended 384, and the southern section to Colindale is duplicated by the 32. A simplified streamlined network with extra orbital connections comes at a price, as the proposed detwiddling of the 384 plainly proves. Joshua would be delighted if a strong response to the consultation stalled the proposed straightening of route 384, although this would no doubt be at the expense of an extension because there's no money to do one without the other. The local MP is on the case, as are the Barnet Society, and a couple of popular petitions are also doing the rounds. Best not go diving in if this isn't your fight, because it's local voices which have credibility, rather than distant bus fetishists sending in crayoned maps detailing how they'd run things better. But the battle is a very real one, the prioritisation of orbital links over neighbourhood accessibility, and if the 384 falls, are any twiddles safe? Tuesday update: a long comment from Joshua! What are the chances... I'm back in King's Cross, less than fifty metres from Coal Drops Yard. This is St Pancras Lock, one of 13 on the Regent's Canal, which has been here for 200 years. Across the water is an old lockkeeper's cottage, its garden now tended by the St Pancras Cruising Club. They're particularly keen on boats, for the avoidance of doubt. The lock's top gates are open and the lower closed, although nobody is barging through. An Arctic wind ripples the surface of the water in the chamber alongside, which spills over the rim into a separate gully. Several leaves and an M&Ms packet are caught in the weir. An iron gate, treated with anti-climb paint, ensures that only those with a key can cross to the central island. Where there used to be one towpath, now there are two. The original cobbled track hugs the canal, where a horse could still use it, but the newest rises up to deliver passers-by into the heart of the Coal Drops. It's like a filter, the serious walkers with boots and rucksacks staying low, and potential shoppers with pristine trainers and smart jackets climbing high. Bags dangling in the opposite direction suggest treats and trinkets have been purchased. One couple rocking a beret'n'beard combo stop by the lock to frame the perfect selfie, then release it via 4G before proceeding. A train bedecked with poppies crosses the canal heading into St Pancras, followed at a safe distance by a double-ended rainbow, because it's important for rolling stock to send messages these days. "Those used to be gasholders," says a well-wrapped bloke to his partner, who looks like she may never have seen one before. "People live inside them now!" An unmade bed is clearly visible inside one of the lower apartments. Nobody is out on their tiny balcony, but a smattering of metal furniture hints at warmer days past. The sole unfilled gasholder, with its mirrored pergola and copious benches, is a lot less busy now a shopping centre has opened in the vicinity. All the flower beds fronting the development are still replete with floral colour, and the teardrop lawns pristine. But scrubby vegetation reigns alongside the towpath, the demarcation line between private and public gardening all too plain. You can't stand here, in the Pool of London, but you can float. I suspect more tourists have been here than long-term Londoners. 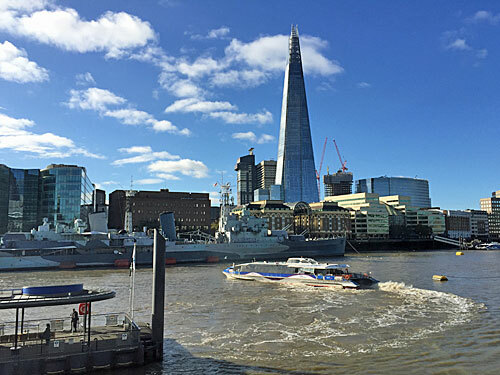 The river is initially clear but choppy, with the twin obstacles of HMS Belfast and Tower Pier slimming the channel. A flock of seagulls has settled on the water in the shadow of the gunship. A couple of visitors can be seen nosing around the gun emplacements at the bow before clambering back below deck. A Thames Clipper motors off from Tower Pier and spins upstream, leaving a curve of churning froth in its wake. Just for a second it crosses the point precisely two miles east from Charing Cross and becomes a useful photographic marker. A logjam of further boats arrives, jostling for position beside the pontoon or waiting patiently for the hubbub to subside. One of the vessels is a tourist launch named Mercedes, the oldest Westminster Party Boat, its upper deck crammed with revellers who had hoped the weather was going to be warmer. Those wishing to board a City Cruise should manoeuvre to the tip of the pier, but only once they've shown their inkjet printout to the ticket gods on the gangway. Don't waste time snapping Tower Bridge from here, you'll be underneath it in a few minutes. The section of the Thames Path closest to the 'two mile' marker has been sealed off for the construction of luxurious Barratt homes. On the approach is a cluster of fake igloos, a winter promo inside which toasty families can be seen ordering drinks from the dedicated gin menu. Far cheaper fun is to be had on the narrow beach uncovered by the low tide. Here mudlarkers pick across pebbles and sand, and a line of wooden posts reveals the damp stunted remains of former wharves. I attempt to join them, treading carefully down the slippery stairs, until the antepenultimate step proves to be entirely covered with an inch of gloopy mud, and my trainers think better of it. Every compass-quartet has its lowlight, relatively speaking, and once again it's south which fails to deliver. Thorncroft Street is an unremarkable residential road in South Lambeth, a few hundred metres in length, its former terraces erased after WW2. Their replacements are sturdy multi-storey blocks - Dean Court, Sheldon Court and Burden House - the latter proudly owned by the Church Commissioners. Given the choice, Burden House looks the nicest. You will not be getting into any of their railinged gardens. We may be only two miles from the centre of London, but owning a car is really popular here. A red Corsa arrives, radio pulsing, and manages to find a gap in the parking bay. A young couple emerge, unlock the boot and take out a week's shopping and two cat carriers. Another couple have driven back from the gym, with hubby in beach shorts carrying a stuffed Lonsdale bag. The cabbie with the light blue taxi drives off so his mate can fill the vacant space with an estate. I smile when I see that the driver of the white van from Harvey & Brockless, "the fine food co", is stuffing his face with a saucy chicken takeaway. Luke, the golden retriever, has stopped to be admired by the neighbours. His owner questions what might be stuck around his mouth, then walks very slowly in the direction of Sainsbury's. A pink suitcase with a butterfly design has been abandoned on the pavement beside most of an apple. Someone has dumped a broken chair next to the bins. Finches flock to the feeders on a balcony brightened by tubs of geraniums. An old man limps past the basketball court towards the pub on the corner, the sole building to survive postwar demolition. The Nott is an uncomplicated careworn boozer offering Chinese cuisine, rock'n'roll on Fridays and a night of misspelt Halloeen entertainment. For those in need of karaoke, a banner above the door lists Elvis's mobile number. 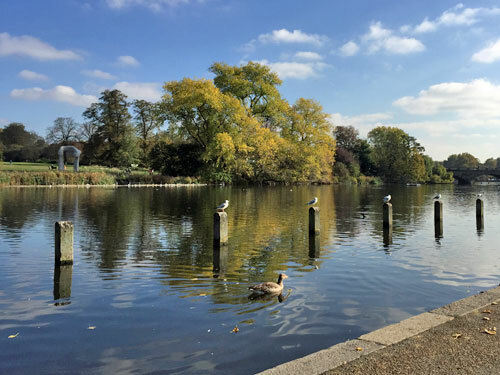 Here's a lovely spot in Kensington Gardens you might just know, the first waterside vista to the south of the Peter Pan statue. Kensington Palace is to the west, on a sightline behind the Physical Energy statue, while Henry Moore's 37 ton Arch lies immediately across the lake. You may know it as the Serpentine, but officially this end is the Long Water. Pleasureboat-free, it's the sanctuary waterfowl prefer. One gull has perched on each of the wooden posts along the water's edge. Two swans glide by. A moorhen disappears with a ripple. The footpath is busy, with tourists and hire bikes and over-bellied joggers. One well-prepared party pauses to scatter crumbs on the ground, which is the signal for avian scrutineers to hotfoot over. The air is briefly full of ducks. Several geese hop out of the water. All but three of the wooden posts are now empty. The crumb-sower whips out his phone to grab the photo he wanted, beaming to camera, than quickly walks on. The geese progress further onto the lawn, where an entwined couple are finishing off a treat from the Hummingbird Bakery, surrounding them on two flanks. I hope they looked carefully at the grass before they sat down. A long bench runs down to the water, one of its wooden slats uncomfortably missing. I grab a seat at the far end after a retired couple have departed, and just as a single yellow leaf floats down and lands beside me. The green box which is supposed to contain a lifebelt appears to be empty. Two Peroni bottle caps lie on the tarmac. A rustic-looking sign urges "No bathing, fishing or dogs permitted in this lake". Most of the ducks and geese have had enough of waddling and have returned to the lake. The trees across the water look splendid. Nobody else is here because of the precise distance it is from Charing Cross, but sometimes following the numbers pays off. If you used to go clubbing at Bagley's, in the derelict wastelands north of King's Cross, you'll be amazed at its transformation. 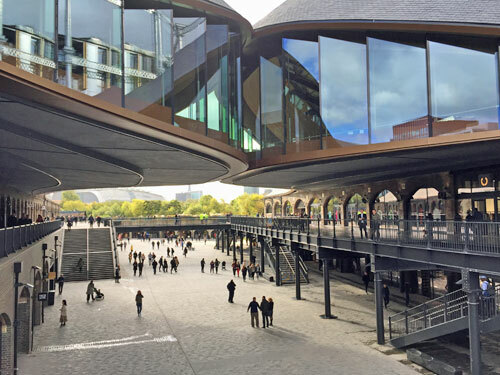 A pair of 19th century fuel sheds have been reborn as Coal Drops Yard, a premium retail experience designed by Heatherwick Studios, who've basically taken credit for dropping a glass swoosh on top of two brick warehouses. It opened yesterday at noon, and I visited during the first hour to see what it was like. Fundamentally it's a shopping mall, albeit a particularly smart one, in two halves with a canyoned piazza inbetween. 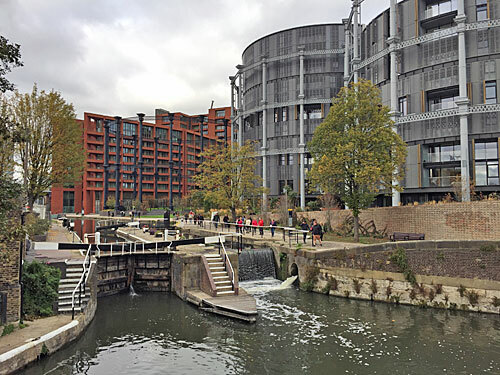 Visitors swirl in from Granary Square, or descend the steps from the unfinished corner by the gasholders, or walk through an arch direct from the Regent's Canal towpath. Security guards linger here and there to make sure nobody does anything too unruly. Hoardings declare CDY's purpose as STORES DINING CULTURE, but the website prefers to go with SHOP EAT DRINK, which is more to the point. The uppermost pointy level will be occupied by Samsung, whose brand showcase promises to "bring the latest technologies to life with curated experiences". It opens next year. Lower units are already filled with boutiques, botanicals and eateries - no big chains - with names like Morty & Bobs, Emin & Paul and Form & Thread. The ultimate double act is Wolf & Badger, whose three-storey repository is a painfully modern kind of department store, little more than a sparse scattering of independent brands for the smart set to pick over. Above the wellness cooler and the metalwork corner I followed a corridor of crafted cushions to a barely-stocked bookshop, and marvelled at the carefully-considered irrelevance of it all. It's a bit nippy for October, with an Arctic blast expected to keep temperatures in single figures throughout the day. But how normal is this? When does autumn's first cold spell usually kick in? In meteorology, there is no such thing as normal. But what I can do is look back at recent autumns to see when the first chilly day arrived. Specifically I've checked back through every year since 2010, using data from Hampstead, to find the first autumn day with a maximum temperature below 10.0°C. The earliest date in the list is 20th October and the latest is 20th November. In statistical terms it's usually good to remove outliers, so let's cut those two, which leaves 26th October - 17th November as the "normal" period during which temperatures first return to single figures. That three week period begins right around now. Today's Arctic blast is not extraordinary. I can perform a similar analysis at various borderline temperatures. Roughly speaking, the first autumn day not to reach 15°C tends to be in the second half of September, i.e. the switchover between summer and autumn. The first day not to reach 10°C tends to be near the start of November, i.e. just after the clocks go back. And the first day not to reach 5°C tends to be in December (although in 2015 it slipped into mid-January). There are no clear patterns for "the first day not to get above freezing", as this is a much rarer event. Those were firsts. How about lasts? Summer's last heatwave could be at any time in August or the first half of September. The last warm day (20°C or above) is a late September/early October thing. And the final mild day (15°C or above) is probably due during the next three weeks. Then there's the other end of the year. London's first 15°C day is usually in March, 20°C in April, 25°C from mid-April to mid-June, and 30°C in July. If you live some distance from Hampstead, or elsewhere in Britain, I don't need to remind you that your dates may be different. If today is the first day this winter not to reach double figures, then the last such day is likely to be in April, maybe even early May. Only six months to wait. Wrap up warm. Where in zone 1 is furthest from a station? Central London is well-blessed with stations, for which we must thank the Victorians and Edwardians. Wherever you are in Zone 1, there's very probably at least one tube or railway station within half a mile of where you're standing. But not quite everywhere is close to one, so today's challenge is to locate Zone 1's accessibility coldspot. My first problem is that buildings, gardens and even the River Thames sometimes get in the way of where you want to go. To simplify things, I've decided to always measure distances in a straight line, even though it might not be possible to walk direct. This is helpful, because it means I can reuse the special 'Nearest station' map Ollie made for us earlier in the year. Wherever finally ends up being "the furthest from a station", I know it must be at one of the points where the boundary lines on Ollie's map meet. My second problem is that Zone 1 isn't well defined. I know which stations are in Zone 1, or on the boundary, but today's question is about the areas inbetween which are much woollier. Everything within the Circle line is obviously in Zone 1, but the zone's extent is particularly unclear south of the river and nudging into the East End. My definition is going to be whether I think a station built at the point in question would likely be in Zone 1 or not. That's a bit subjective, but let's run through the contenders, firstly four "almost certainly yes"s and then two "most probably not"s.
The outright winner, the spot in Zone 1 furthest from a station, must surely lie within one of central London's largest parks. Hyde Park and Kensington Gardens cover over 600 acres, and are entirely station-free, so let's look there. The Central line runs along the northern perimeter, with stations at Queensway, Lancaster Gate and Marble Arch, so my target should be somewhere nearer the opposite edge. 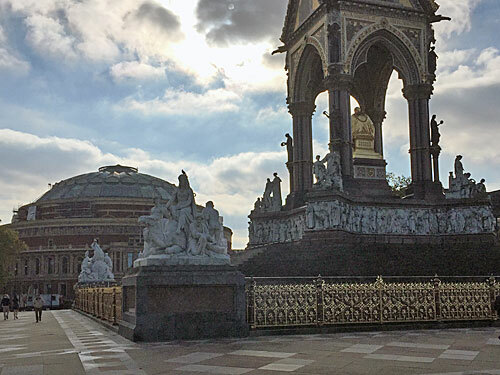 It turns out that the "most remote" spot in Zone 1 is beside the Albert Memorial, in fact on the northern edge of the square surrounding it. From here Lancaster Gate, Gloucester Road and South Kensington are each almost precisely 1km away. I checked with Citymapper and it advised me of a 16 minute walk to each. Those who live elsewhere in the country might think 16 minutes is peanuts, but in central London it's about as far as you can get. Embassy Gardens is the new luxury housing development going up around the US Embassy, on the southern side of the Thames. 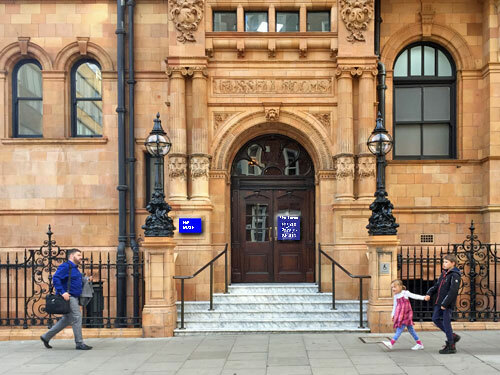 It may not surprise you to hear that the "most remote" spot hereabouts is the Chancery Building, the estate's lowlier shared ownership block. This lies back from Nine Elms Lane, beyond Waitrose, in what'll be a gloomy corner once all the surrounding towers shoot up and block out the sun. 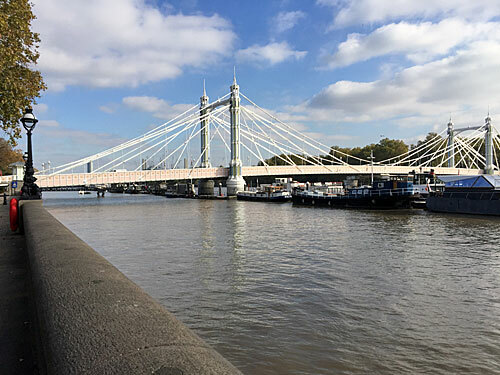 At present it's almost a kilometre from Battersea Park, Vauxhall and Pimlico stations - the latter impossible to reach direct because of the river. In a couple of years this spot will be approximately midway between two stations on the Northern line extension - Nine Elms and Battersea Power Station - so considerably better connected. 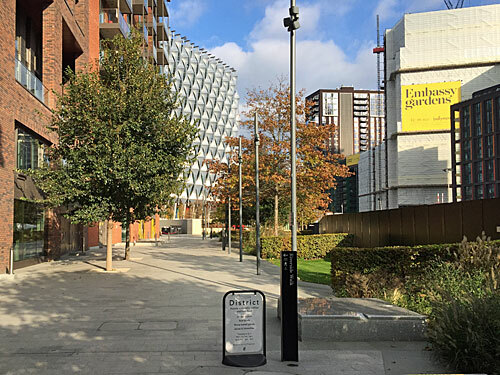 It's Boris's pledge to place both of these in Zone 1 which allows me to confirm that Embassy Gardens deserves its place in my list. My next inaccessible backwater lies along the main road hugging the north bank of the Thames between Battersea Bridge and Vauxhall Bridge. Specifically it's at the point where the mainline railway out of Victoria heads south across the river, beside the Grosvenor Road Carriage Sidings, almost immediately opposite Battersea Power Station. From 1867 to 1911 there was a station right here, unsurprisingly named Grosvenor Road, and its subsequent disappearance helps to explain why this spot became a hole in the existing network. Pimlico station on the Victoria line helped plug the gap in 1972, confirming we're in zone 1, but is still 900m away. The other stations we're 900m from are Victoria, Sloane Square and Battersea Park, each approximately 15 minutes walk away according to Citymapper. Crossing town, here's an unexpectedly badly-connected spot in a proper built-up area. 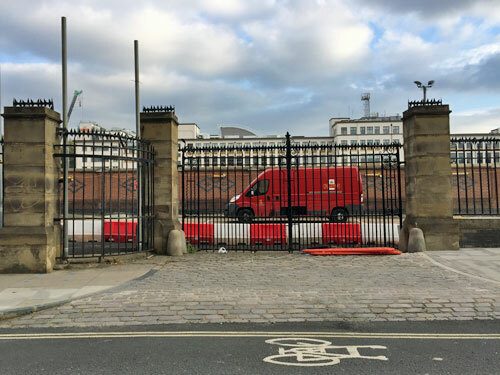 It's on the huge Royal Mail site at Mount Pleasant, specifically the undeveloped bit alongside Farringdon Road, close to the junction with Calthorpe Street. Five stations are almost equidistant, namely King's Cross, Angel, Farringdon, Chancery Lane and Russell Square, each approximately 13 minutes walk away according to Citymapper. What's ironic is that the Underground passes almost directly underneath, and also that this was London's very first Underground line. The Metropolitan Railway failed to build a station here in 1863, most likely because at the time this was the site of the notorious Coldbath Fields Prison, upon which the Post Office mail centre would be built 25 years later. Alas nobody ever came back to fill in the gap by adding Mount Pleasant station, and today's economics dictate they never will, however useful it might be. The Chelsea Embankment never got a tube service and remains a long way from any stations. The District line runs annoyingly far north, via South Kensington and Sloane Square, and the 9-year-old Overground station at Imperial Wharf is a similar distance to the west. I checked with Citymapper, and it advised me of a 20 minute walk to each. Most of the people who live in the smart houses along Cheyne Walk have a car, or would be happy to hail an Uber, so probably don't mind living so far from a station. It's no coincidence that Crossrail 2 is intended to bring Chelsea its very first rail connection, a little further north on the Kings Road. I'm just not quite convinced that this particular spot alongside the Albert Bridge really is in Zone 1, so it probably doesn't deserve to be on my list. As another central expanse of green space, it's no surprise that Regent's Park contains another accessibility coldspot. 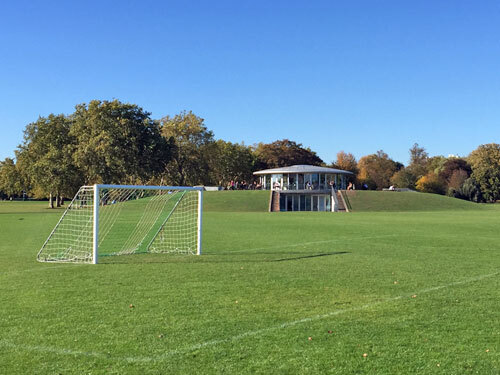 The point furthest from any station lies amid the sports pitches on the northern side of the park, very close to the artificial hill of The Hub with its changing rooms and cafe. It's also very close to London Zoo, specifically the Reptile House, which helps to explain why the zoo is always a bit of a schlep for tourists to reach. The closest stations to the point in question are St John's Wood, Camden Town and Baker Street... although two of these are in zone 2. That's also the case for Mornington Crescent station, which lies almost due east, which again suggests that this particular spot couldn't genuinely be described as zone 1. What's the biggest threat to London? Flood? Fire? Flu? Alien invasion? There is one group of people at City Hall whose job it is to know, and to help us prepare. They're the London Resilience Team, staffed by London Resilience Officers, and they do all sorts of things behind the scenes to keep the capital hazard-ready. Planning for Mass Casualties. Promoting Business Recovery planning. Coordinating Electricity Disruption workshops. Updating the London Recovery Management Protocol (which is a disaster recovery plan you'd probably rather not be thinking about). So, what are the biggest threats to London? The London Resilience Team work this out by rating each risk on a 1 to 5 scale for impact and likelihood, then combining the scores. Impacts rank from Limited (1) to Catastrophic (5), while likelihoods are rated by how likely something is to happen over the next five years (1 in 20000 chance for the lowest category, a 50/50 chance for the highest). This produces a four-point categorisation by colour, with green for the lowest risks and red for the highest. London has eight risks in the red zone, eight that worry the authorities above all others. Below is a grid showing a summary of the ratings for the risks in London's Risk Register. The scale up the side is Impact, and the scale along the bottom is Likelihood. The nearer the top right-hand corner, the scarier. The most pressing risk facing the capital (medium high Likelihood, catastrophic Impact) is Pandemic Disease, with a 1 in 20 chance of occurring over the next five years. This is the threat of a major worldwide influenza outbreak, possibly affecting 50% of the UK population and causing up to 750,000 fatalities. As well as sickness and death, the risk register warns that absenteeism might become significant, affecting business continuity, and that pandemics often come in several waves, each lasting around three months. The last really bad pandemic was the Spanish Flu of 1918, which killed 2% of those infected, and scientists have long feared a mutated rerun. As catastrophic, but less likely, is National Electricity Failure. If the National Grid went down, for whatever reason, the most serious problem would be how to reboot the UK's power stations without a supply of electricity. Rest assured there are well-laid contingency plans, codeword Blackstart, using a handful of power stations with emergency generators on site to eventually kickstart all the others. But the risk register warns of total civilian blackout for up to 5 days, with London reconnected late in the process, and "possible loss of life support machines, civil unrest, no alarms, street lighting, gas heating, rail transport, water supplies and mobile telecommunications etc." A slightly less serious version of the risk is Regional Electricity Failure, which south east England successfully survived after the great storm of 1987. Central London's not at risk from Toxic Chemical Release, but it could affect those living within three kilometres of "a large industrial complex or bulk storage of chemicals". A few such sites exist within the M25, where a serious incident could lead to up to 50 fatalities and 2000 casualties. Contaminants vary, but as well as immediate impacts on air quality, water pollution and agriculture, expect longer term environmental repercussions and prolonged demands on health care services. Coastal Flooding refers to the risk of inundation from the sea, specifically a tidal surge running up the Thames estuary. The worst impact would be on the east coast of England, the Thames Flood Barrier (hopefully) mitigating much of the damage in the capital, although low-lying areas of London remain vulnerable, and there could be widespread structural damage including disruption to transport, power and water treatment infrastructure. Fluvial Flooding travels in the opposite direction, downstream, and could follow a sustained period of heavy rainfall across the Thames basin. The risk register suggests prolonged flooding might affect 363,000 residents, with a few hundred fatalities and over 10,000 casualties. London's most recent serious flood occurred in January 1928 when thawing snow combined with exceptionally heavy rain overtopped the Embankment in multiple locations. I'm afraid Unconventional Attack isn't very cheery. This relates to a mass impact terrorist attack, either against a nuclear or chemical facility or by obtaining and dispersing chemical, biological, radiological or nuclear materials. This stuff is exceedingly hard to come by so the likelihood of such an event remains low, but is not negligible. Any outcome involving widespread dispersion and contamination would have a severe impact on London's ability to function, and on Londoners themselves. Smaller scale attacks only make it into the orange section. And finally there's Severe Space Weather. That's not weather as such, but refers to variable conditions on the sun and in space which can influence the performance of technology we use on Earth. Global Navigation Satellite Systems are particularly susceptible to major solar flares, which could lead to electrical blackouts, GPS outages, disruption to aviation and lengthy interruptions to civilian mobile communication. A huge geomagnetic storm in September 1859, the so-called Carrington Event, merely managed to knock out a few days' telegraph signals. A similar-sized coronal mass ejection today, if pointed directly towards the Earth, would damage many of the electronic systems on which we now rely and full recovery might take several years. The remaining 43 risks in the register are either less likely or of lower impact, probably both. That doesn't mean they're of no consequence at an individual level, just that the overall effect on the capital would be lower. Nobody wants to see Attacks on Infrastructure, Disruption to Water Supply or even Effusive Volcanic Eruption, but at least they're only orange, yellow or green, not red. For further details of what each of these risks entails, see the pdf. It's interesting to note that Brexit doesn't appear, only one or two of its potential consequences, but maybe a few more economic risks will appear when the register is next updated next year. It's reassuring to know that, even if we're not worrying about every negative possibility every day, someone else is keeping an eye on them. All we can do is stay alert and be prepared, and hope that some of the really terrible things never happen. As a minor step you could follow London Prepared on Twitter to keep up with what's going down, or read their 30 top tips to boost your own household's resilience at time of need. And it's probably best not to download a copy of the London Resilience Partnership: Mass Evacuation Framework (v2) for bedtime reading... although somewhere out there, thousands have. 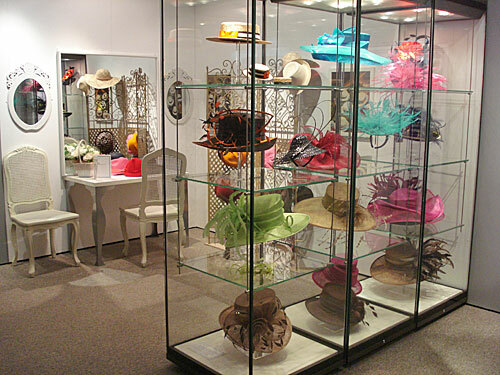 If the London Hat Museum were located a little closer to South Kensington, it would perhaps be better known. This much-loved Westminster repository tells the history of millinery, and history through millinery, which has surely been the key to its longevity. Come any day except Monday, perhaps best avoid half term, and rejoice that access to the collection is still free. The security arch just inside the entrance felt like overkill, especially given how many years unrestricted access has been available from the street. I managed to leave a packet of Polos in my pocket, which set the beep off, and then forgot to pick up a loose pound coin from the tray and only realised afterwards when it was too late. I hope they treated it as a donation. I recommend getting the virtual guide from the main desk to impart information on the way round, although it's a little finicky to press, and low levels of illumination didn't always make it easy to follow. The galleries are both chronological and thematic, which is both a strength and a drawback. One obvious problem with the oldest galleries is that material decays, so the only hats we really have from earlier centuries are metal helmets. 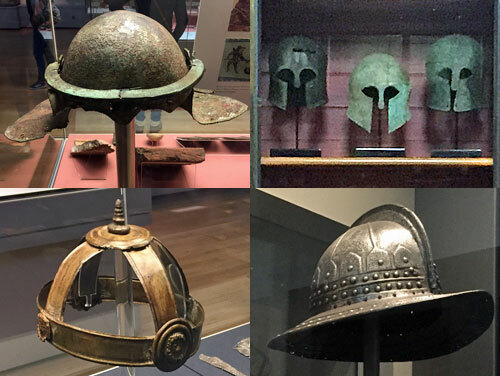 The focus on battle dress isn't to everyone's tastes, but some of the Roman metalwork is exquisite, and the 1st century gladiator's helmet (top left) is a rare treat. It was ploughed up in a Suffolk field in 1965, along with a broken brow-guard which was kept in a shed until 2001 when both parts were finally reunited at the museum. The bronze headdress (bottom left) is normal for Celtic Norfolk, and is thought to be priestly regalia. Once the Middle Ages kick in, a more hands-on approach is taken. Children will love the opportunity to don various items of headgear, some woollen, others notionally animal skin, and posing in front of the mirror. Several adults were giving it a go too, dressing up as Elizabethan maids in lacy court caps and eagerly Instagramming the result. It turns out those diamond-shaped French hoods everyone remembers from doing Henry VIII in history were de rigueur in the 1520s, complete with constituent parts called the coif, the crepine and the bongrace. I found the 18th century gallery rather less fun, probably because of all the wigs. Rest assured that other parts of the world get a proper look in. 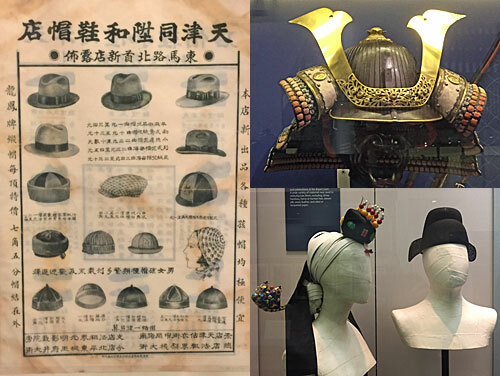 I was particularly taken not only by the samurai helmets, but also by a series of Japanese newspaper adverts displaying a host of out-of-date classics available for gentlemen and ladies. We're told that Korea was once known as The Land of Hats, as no visitor to the peninsula would dare be seen outside without one. It's fascinating to see how other cultures were comfortable wearing bamboo, human hair and lacquered paper on their heads, rather than the drab straw or tweed we might have been sporting over here. The cafe comes halfway round, which is unusual, but I guess the former Pillbox Gallery was the easiest to transform. Mid-afternoon it was quite quiet, but the top-hat-themed soft play area was seeing good use. Then it's back into the fray with what I christened The Bonnet Years, a seemingly endless cavalcade of twee floral fabrics and dangling ribbons. What looked like teacosies were actually Dutch caps - thankfully not labelled thus - sewn from scraps of leftover Indian chintz (bottom left). But wow, what a coup to have Queen Victoria's actual bonnet from the actual Golden Jubilee, on loan from the collection of the current monarch (bottom right). My favourite gallery is London Contemporary. It's been laid out like the top deck of a red London bus, with a mannequin in each seat adorned with a huge variety of streetwise headgear. From beanies to crocheted Rasta tams and off-to-Ascot fascinators, a full sense of the capital's sartorial life is revealed. There's even a Pearly Queen's feathery confection up the rear, and the gentleman under the deerstalker is obviously meant to be Sherlock Holmes. I would have grabbed a photo to show you, but far too many children got in the way, and that's not the done thing these days. An obvious, but nonetheless illuminating gallery showcases all kinds of occupation and their hats. The emergency services get the expected look-in, but it was refreshing to see the hat worn by London's first bus conductress and a genuine suffragette's prison cap. Even a Nippy's starched maid's cap is included (top left), alongside fake cakes that looked more appetising than those back in the cafe. 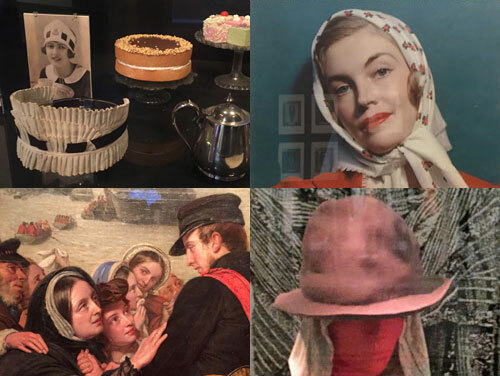 As things get more up to date, I'm not quite sure why paintings of headscarves count, but that maroon Vivienne Westwood felt number (bottom right) is perfectly representative of the wilder end of the collection. 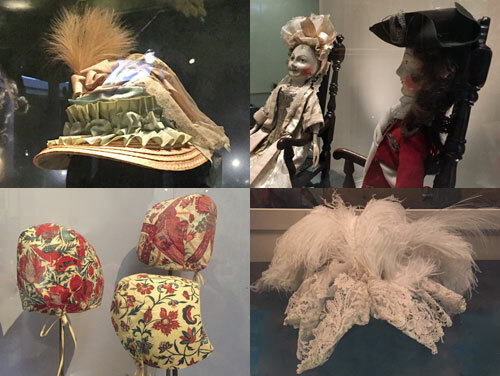 If you get down to the London Hat Museum before the end of October, you can enjoy their temporary exhibition looking at Balaclavas Through the Ages, after which a Remembrance-based exhibition will kick in, focusing on berets, caps and helmets from the armed services. But it's the main galleries which have eternal appeal, a little moth-eaten in places, but a perennial London favourite all the same. That's the power of the hat. The interior of the Millennium Dome is now (almost) complete. Took long enough. Ever since 2007, when New Labour's Teflon tent reopened as an entertainment hub, it's only been possible to turn right on entering. A crescent of dining opportunities curved round to the far side of the complex, past numerous restaurants and the occasional cinema, but the only shopping experience on offer was a tiny newsagents which excited nobody. Now suddenly turning left has become an option, with a lengthy shopping mall finally completing the circuit and giving visitors something entirely different to do. It was going to be a super-casino, back in the Blair era when super-casinos were the thing, so the O2's owners kept 120° of their circumference empty in readiness of planning success. But London's super-casino went to Westfield in Stratford instead, and North Greenwich was left with a hole nobody's got round to filling until now. It's called Icon, and looks very much like you'd expect a shopping mall to look. Over on the Dome's restaurant boulevard it's impossible to escape the feeling that you're walking through a cavernous tent with boxy infill, but this new addition is overhung by a chain of illuminated ribs which acts as a suspended ceiling, making it feel more like Bluewater, Westfield or Intu Somewhere instead. Ascend the escalators at either end to enter this brave new retail temple. The arcade nearest the main entrance is solely at first floor level, and lined by narrow-fronted shops on either side. Many of these are already open but many are not, partly because there's a recession on, but mainly because it's still early days. The shops are almost exclusively of a type - slightly upmarket clothes and accessories - including such non-necessities as Calvin Klein undies and Aspinal handbags. If you're wondering why the shops get micro-thin opposite the artisan coffee outlet, it's because the mall has to bend around the ventilation tower for the southbound Blackwall Tunnel. I counted up the shops along this first section and tallied ten units open and seven closed. Things got even quieter through the central section, the furthest from each entrance - thirteen units open and twelve closed. Temporary frontage and low footfall meant it all felt a bit dead, even for a weekday morning, but on opening weekend the place was no doubt buzzing thanks to numerous 'brand activations'. Hackett were offering complimentary monogramming, GANT were dishing out a free Duffle if you spent £200 or more, and Cath Kidston had installed a flower wall as a prize-winning selfie backdrop. You may already be getting a sense of whether this place is for you. Eventually the mall reaches a gaping atrium where one of the Dome's big yellow spikes plonks down, and where one of the entrances to the O2's main arena is located. Beyond this the shops continue at ground floor as well as first floor level, although only the upstairs lot are open at present. Ten open and three closed is a better ratio than we've seen thus far, and the clothing emphasis isn't quite so strong, with tea and perfume and smelly candles thrown into the mix. It's also worth noting that the overhead decor's different at this end, here bedecked with a net of floaty white quadrilaterals which reveals more of the actual roof. The last shop, or the first if you're wandering anti-clockwise, is the only store to brand itself as an outlet. Everything in the Gap Outlet store is 50% off, which is a pretty substantial discount, with handy ready reckoners above the shelves in case you're no good at halving. Even I was thinking "oh, that's not actually a bad price for a shirt", so will be back, relieved I no longer have to trudge over to Wembley Park for something similar. Apparently the whole of Icon is supposed to offer "a variety of premium brands all at accessible outlet prices", but not one single other store has made this obvious - their racks unflashed and their windows unpostered. Downstairs is odd, even eerie, with the entire run of twenty-odd shops still covered up. That'll be because this is phase 2, opening 2019, as the retail offer ramps up another notch. For now staff are washing piazzas nobody's using, and plugging in amplifiers on a stage nobody will be flocking to, and wondering what anyone's doing down here when there are trainers and chocolate advent calendars on the floor above. In summary, Icon isn't a must-visit, more somewhere to spend surplus cash on non-essentials if that's what you enjoy. It appears ideally targeted at parties from the Home Counties here to watch U2 or Andrea Bocelli, if only there weren't rules about taking large bags into the auditorium. It's also hoping to attract eager foreign tourists who don't want to have to schlep all the way to Bicester for cheap designer goods, but the overall vibe isn't yet outletty enough for that to succeed. Icon's certainly a more interesting way to pass the time than the restaurants round the other half of the circumference, and has its moments, but has yet to prove it could become a regular hangout for ordinary Londoners. 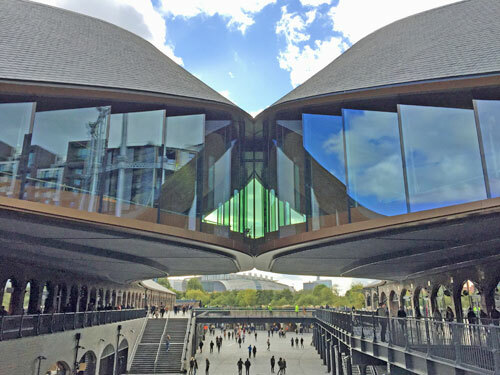 And Icon is about to be outshone next weekend by a fresh opening at Granary Square - Coal Drops Yard. 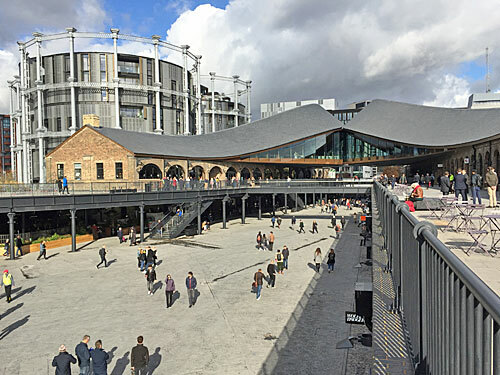 This former carbon depository and nightclub to the north of King's Cross is reopening as a 'curated' retail experience packed with snobby brands at unreconstructed prices, aiming at sluicing the plastic of warehouse-dwellers and Eurostar travellers. Icon may be one step down the luxury ladder, but it cements the future of the Millennium Dome, and might even contain something you actually want. Allow me to introduce the TfL Polygon. This is the area inside which all TfL services run. Specifically it's the smallest convex polygon encompassing all TfL-operated services. That means the boundary is all straight lines, and none of the angles bend inwards. All of the vertices are either stations or bus stops. You cannot catch a TfL service outside this shape. Here's the map. This is an entirely unofficial thing, and also inherently meaningless. But I still think it's interesting, so indulge me for a moment. The TfL Polygon has nine vertices. Clockwise from top left, they are Chesham, Cheshunt, Epping, Shenfield, North Stifford, Bluewater, Chartwell, Dorking and Slough. The first four vertices in that list - the furthest north - are stations. All the other vertices are bus stops. To make this exercise worthwhile, we need to look at the TfL Polygon in relation to the boundary of Greater London. As you can see, the TfL Polygon is larger than Greater London. Specifically it's 70% larger, having an area of 2704km² whereas Greater London covers 1569km². On average, the TfL Polygon runs three or four miles outside Greater London. The greatest distance is seven miles, to Chesham - a legacy of the Metropolitan line stretching way out into Buckinghamshire. A tiny section of Havering, near North Ockendon, lies outside the TfL Polygon, but that's OK because almost nobody lives there, and it probably shouldn't be part of the capital anyway. It's by no means the case that everywhere inside the TfL Polygon gets a TfL service. There are no buses in the northwest corner, only a tiny handful of stations. There are no TfL stations to the south of Greater London, only a tiny number of unusually long bus routes poking down into Surrey and Kent. In general TfL services creep minimally over the Greater London boundary, because TfL exists to serve its own home area, and the few outliers which define the vertices of the TfL Polygon are very much the exception. Let's run round the boundary and see what's going on. This is the longest side of the TfL Polygon, at 25 miles in length. It skirts Rickmansworth and Watford, then runs just north of the M25 from South Mimms eastwards. A year ago there would have been an extra vertex here in Potters Bar, nudging fractionally north, but when TfL cut back route 298 from the Cranborne Road Industrial Estate to the station, that disappeared. Before May 2015, when services to Cheshunt became part of the Overground, this vertex would have been a mile to the south at Waltham Cross bus station instead. Meanwhile the Epping vertex is another legacy of the outer suburban Underground. It would have been considerably further out in Ongar until 1994, and the extent of the TfL Polygon perhaps illustrates the sense in cutting back. Shenfield is another May 2015 addition, courtesy of Crossrail. Prior to TfL Rail taking over this end of the line, the corresponding vertex was on Brentwood High Street, served by the number 498 bus. TfL aren't here to serve Hertfordshire and Essex, which is why no London bus routes cross the M25 between Potters Bar and Brentwood, other than dribbling a few hundred metres over the line in Waltham Cross. Here's the only side of the polygon which passes (very) briefly through Greater London. The redundant part of the capital (near North Ockendon) is mostly fields and a golf course, and home to barely a dozen people. The next vertex at the Davy Down bus stop in North Stifford is only necessary because the 370 bus wiggles into Lakeside shopping centre from the east, otherwise a straight edge direct from Shenfield to Bluewater would have sufficed. Here's why you shouldn't take the TfL Polygon too seriously. It may only be four miles direct between the bus stops at Davy Down and Bluewater, but to travel between them using TfL services requires heading at least 20 miles upriver to Woolwich and then back again. The journey can be done almost direct using an hourly Thurrock bus service, but crossing the Thames estuary by public transport is an ill-served afterthought. Once again, this edge of the TfL Polygon closely follows the M25. Chartwell's bus service is a real oddity, a Sundays-only summer extension of route 246 to Winston Churchill's house, now a National Trust property. Once November rolls round, and until March, the Chartwell vertex reverts to the Kent town of Westerham. This reduces the area of the TfL Polygon by 50km². The southern edge of the TfL Polygon is a consequence of three particularly long bus routes stretching well out of London. As well as the 246 to Chartwell there's the 405 to Redhill and the 465 to Dorking. Redhill becomes a vertex of the TfL Polygon in the winter, narrowly, when the 246 retreats to Westerham. The 6½ mile elongation of route 465 into the depths of Surrey is a true anachronism, but Surrey help with funding, so who's complaining? This edge of the TfL Polygon is 20 miles long, skipping through rural and suburban Surrey. I had to check carefully to make sure we didn't need an extra vertex in Staines, but not quite - the bus station's half a mile inside the specified boundary. When I say Slough, I mean a bus stop on the High Street by the Queensmere shopping centre, served by route 81. It's TfL's westernmost bus stop, and we've also visited the southernmost (in Dorking), though not the northernmost nor easternmost. And finally it's back to Chesham, marginally skipping Amersham, through a non-TfL hinterland where public transport costs a lot more than £1.50 a journey. When Crossrail is complete, on some belated unspecified date, the TfL Polygon will extend considerably to the west. Reading is 17 miles further out than Slough, which adds 750km² to the polygon's internal area, a 25% increase. Only five additional stations lie in the extension zone, again confirming that the TfL Polygon is practically irrelevant to those living within it. But as a measure of TfL's ambitions to extend its influence beyond Greater London, balanced against the realities of a budget forcing it to retreat, it's an intriguing indication of intent.